13 MOON MYSTIC - Global Online Offering - only $18 per month! The New Moon represents a time for planting seeds. It’s when the Moon is hiding behind the Sun, and you can feel her Divine potency. She is the Divine Feminine, always listening to the beating of our hearts and the whispers from our soul. The New Moon is time for going in and being quiet with your thoughts and wishes. It’s time to surround yourself with the energy that feeds your soul and resonates with your dreams. Receive deep meditations that you can take with you and commit to your wishes. Find expansion in your heart and focus on your truth. The next 13 Moon Mystic begins in January 5, 2019. We meet every month ONLINE as a powerful sangha; supporting each other in transparency, commitment and vulnerability on our personal journey to truth and connection. We begin together, pulling back our arrow and aiming toward our deepest wishes. 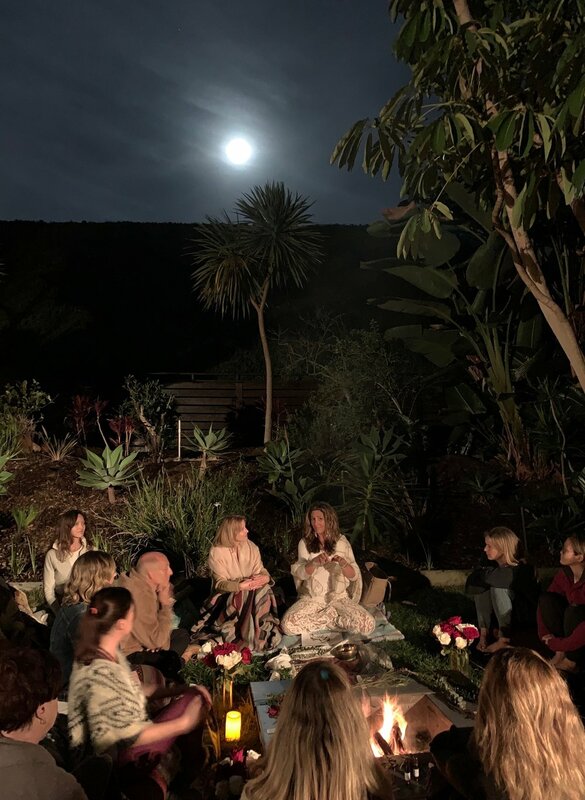 Join me every month, in the comfort of your own home, for New Moon practices, meditation, and sacred ritual to connect you deeper to your truth and alignment with the Moon and Her cycles! Suitable meditation for this Lunar cycle and suggested essential oils that can enhance your practice. Full Moon recordings to compliment the in person gatherings. Join 13 Moon Mystic for $18/month! Aum Shreem Som Somaya Namaha ! Gather, celebrate, release and stand deeper in your truth. These circles are open to women AND MEN!! It’s very important for the energy of Shiva, the male principle of Divine energy to be present for higher resonance and connection!! Bring something to write with, a yoga mat, cushion, a journal, and an offering for the fire. We dive into the energy of Shakti: the female principle of Divine energy, the universal power and the unexplainable movement of energy. Shakti is the dynamic quality that is pumping the blood through our veins, flowing the breath through our lungs, and connecting us energetically to others. It’s the energy that creates everything. She IS the Moon - the Moon IS the Feminine. Understanding her rhythms and cycles and how they relate to you, is imperative in evolving and aligning with your soul’s calling. BEING IN CIRCLE breaks open the heart and when communities gather, relaxing into the power of Shakti, it creates the potential for miracles to manifest. How this circle will unfold is unknown, it is divine and you will be a part of it.